A tub water garden is perfect for the less-experienced gardener or for water gardeners with space limitations. You can create an aquatic wonderland with special water gardening tubs, terra cotta pots, lined wooden barrels, hanging baskets, dishes, bird baths, copper containers, or troughs. Any type of container will work, as long as it is watertight. A small pump and filter are optional for most container water gardens, unless you want to attach the pump to a fountain or bubbler. 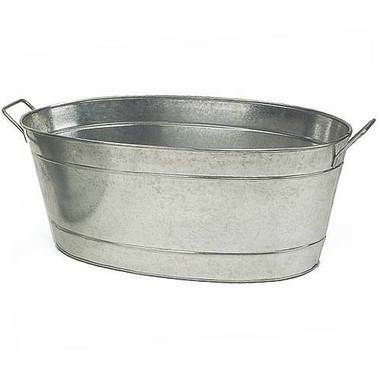 you can use a galvanized steel bin! Place your tub garden in a sunny spot; most water plants need 4 to 6 hours of full sun each day, preferably morning sun. For climates with very hot summers, display your tub where it will receive 2 to 3 hours of shade during the hottest part of the day. Locate your tub where you can enjoy it the most. Do not place near areas where you may be using herbicides to avoid killing your water plants or injuring your fish. Choose a large watertight container that is at least 15" in diameter and 12" deep. Fill your tub with water from a hose and treat to dechlorinate using stress coat or ammo lock. Planting a tub water garden step by step!! 1. Place your tub garden where you will enjoy it the most! The location should be level and provide appropriate light. Sun kits need four to five hours of direct sun daily (in hot areas, provide two to three hours of shade during the hottest part of the day). Fill the tub about 2/3 full with water. Dechlorinate and let water stand for five minutes. 2. Place your aquatic plants in the shade and cover with a wet newspaper during container preparation. 3. For anacharis and other oxygenators, place them in the smallest pot (3.5 quart). Fill in with sand to hold root ends in place. Cover sand with a layer of gravel. Or, place old growth ends under gravel or a stone and roots will form to hold plants in place. Go to step 7. For marginal plants and water lilies, fill a plastic planting container 1/2 full with heavy garden soil. Remember to use a container without bottom drainage holes. Insert fertilizer tablet (if supplied). 4. Dig a planting hole in the soil. 5. Gently place the plant in the hole (water lilies need largest pot). Spread the roots in the planting hole. Cover with additional soil. Make sure crown (where roots and stem join) is free of soil. 6. Add an 1/2-inch layer of gravel to keep the soil from washing out of the container and muddying the water of your tub garden. 7. Gently lower your potted plants into the tub. Set lilies 10 to 18 inches under water. Its leaves and flowers will rise above the water surface. Using bricks, elevate marginal plants 1/2 to 6 inches below water surface and set at pond’s edge. Submerge anacharis beneath the water surface. Before adding fish, make sure to dechlorinate your water. Treat your pond for bacteria and parasites before adding new fish to a container that already stocks fish. Two weeks is a proper time to wait between setting up your new system and stocking fish. During this time, your water garden will cure (grow beneficial algae). 1. Float the unopened bag in your pond for at least 20 minutes. 2. After 20 minutes, slowly add small amounts of pond water to the bag to acclimate your fish to their new pH. 3. Release your fish and scavengers into your water. You may need to use your hands to scoop the fish out and place them in their new home. Do NOT add the water from the bag to your tub garden water. 4. Wait 3 days, or until the fish are actively swimming, to begin feeding. In spring/summer, feed once or twice daily with protein-rich food; in fall, feed with low-protein food. Watch fish closely for signs of problems. Note: After introducing your snails, they will sink to the bottom of your pond and may remain inactive for 7 to 10 days. I am definitely going to add this in my new landscape design. I&#x27;d love to see some lilies. I think this will be a good addition. Thank you for sharing! This is a good start if you want to cultivate plants in the household. Might as well implement this on some areas that lacks more soil in the backyard. This is a very good start to be a environmentalist.